Shiva for Roz will be held on Saturday, Feb. 4th beginning at 6:30PM at the residence of Harold and Flora Cherny, 6156 Westbrooke Dr. West Bloomfield MI 48322 Phone: (248) 339-6071. Religious services will be on Saturday evening at 7:00PM. Rosalyn (Roz) Stern, 73, passed away on January 31, 2017, at Hope Hospice of Cape Coral, Florida. She is survived by husband Aaron (Butch), sons Ronald (Cheryl), Todd and David. Loving Bubbie of Nathan, Samuel and Jonah Stern, Sister Flora (Harold) Cherney, sister-in-law Darlene Robson and brother-in-law Marty (Louise LeBlanc) Stern and many nephews and nieces. Roz was born in Detroit, Michigan in 1943. 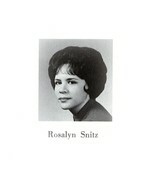 She is preceded in death by father Norman Snitz, Mother Sarah Snitz and brother Stanley Snitz. Roz and Butch were married for 54 years and, after Butch's retirement in 2000, moved to Cape Coral. Roz loved cooking and baking and always had room at the table for family and friends. She also enjoyed traveling, cruising, and playing Maj Jong. Click here to see Rosalyn's last Profile entry.